Neck pain can affect people of all ages and the usual cause is postural or how we use our necks. To treat neck pain Ayr, contact us on 01292 737 390. These days the majority of working people spend their working day in an office sat at a computer. Inevitably, the neck and shoulder muscles can very easily become strained, stiff or overused. Long term neck pain can be caused by other triggers such as stress and tiredness as can osteoarthritis (age-related wear and tear) in the neck. Osteoarthritis can also cause not only muscular pain from the neck into the shoulder but also difficulty and stiffness in moving the neck. Pain from the neck moving down into the arm can be caused by an irritated nerve and is sometimes accompanied by pins and needles and numbness. If you find that your arm is weak you should see your doctor. Less often, nerves in your neck may become trapped making it difficult for you to use your hands for manipulating things and can even make you lose your balance when walking. If these symptoms occur you should see your doctor. Appointments at other times are available by arrangement. 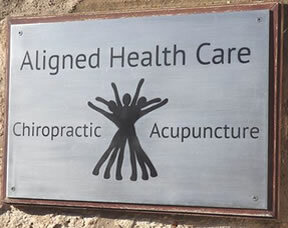 Aligned Health Care Chiropractic Clinic in Ayr is dedicated to helping people regain and maintain control of their health through a holistic chiropractic approach. We accept all major debit and credit cards, cash and cheques. © Copyright Aligned Healthcare Limited. All Rights Reserved.